Adolf Dassler (born in Herzogenaurach, Germany, 3 November 1900 - died in Herzogenaurach, 6 September 1978 at age 77 years), commonly known as the Adi Dassler was the founder of Adidas, the sportswear company from Germany. Trained as a baker, Adi Dassler started to produce his own sports shoes in his mother's wash kitchen after his return from World War I. Christoph her ​​father - who worked at a shoe company, and his brother Zehlein, which produces spikes for good running shoes in the store iron - support Dassler started his own business, Adidas (Adi Dassler). In 1924, his brother Rudolf Dassler joined the business. Rudolf went on to establish a business rival Puma. At the 1928 Summer Olympics, Adidas equip several athletes, laying the first stone for the establishment of an international development company. In May 1933, Dassler joined the NSDAP. He is a national-socialist leaders who are faithful and recruited to serve in the Wehrmacht at the beginning of World War II. During the 1936 Summer Olympics, Dassler equipped gold medal winner Jesse Owens with the shoes. In 1973, the son of Adi, Horst Dassler founded Arena, a manufacturer of pool equipment. After the death of Adolf Dassler in 1978, the son and daughter Käthe took over management. Adidas is converted into a private limited company in 1989, but remained the property of the family until its first public offering in 1995. History of the famous brands of shoes that was started in 1920 by Adi (Adolf) Dassler in his mother's laundry room. Adi Dassler's time to make a small project by making athletic shoes. Because of the high quality of shoes produced, eventually a small business is coming to fruition. In 1924, Adi Dassler and his brother Rudolf Dassler founded the "Dassler Brothers OGH" which later became the forerunner Adidas now. 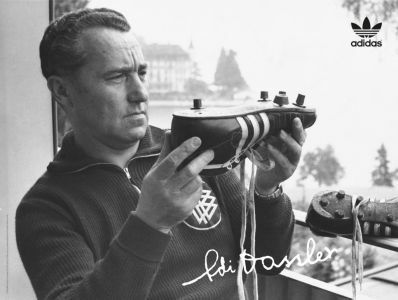 Adi Dassler commitment to quality, bringing Dassler Brothers as a producer of high quality shoes, so often worn by legendary athletes for the Olympic period. Peak Dassler shoes Brothers fame was when Jesse Owen became the most successful athlete at the 1936 Olympics in Berlin wearing Dassler shoes made. In 1948, Adi and Rudolf decided to split up and each one makes his own brand of shoes. Rudolf made shoe brand 'Puma', while Adi create brand 'Adidas.' Making a name derived from the name Adidas Adi Dassler, Adi by combining the first name and a surname Dassler syllable of 'das' so that it becomes the word 'Adidas'. Just the information that the original name was Adolf Dassler, Adi Dassler, but the Germans used to call the name of Adolf as Adi. Supported by advances in the field of broadcasting and television, adidas enjoys the advantage of sporting events like the Olympics or football, because of their 3 stripes logo is easily recognizable from afar. He also register 3 stripes logo as a trademark of adidas. 3 stripes are created so that the foot is stable, but eventually became the logo. Own use of the new Adidas logo is used in about 1948, at the time of the Dassler brothers parted. Visually, the Adidas logo Adidas just a letter, with the name Adolf Dassler shoes above and illustrated in the middle. With this brand, made by Adi Dassler shoes reached a success, with the recognition of brand shoes Adidas diajang world such as the Olympic Games, Helsinki, Melbourne, Rome and others. As well as the German soccer team won the football world with Adidas shoes. In 1972, Adidas logo that changes by using the concept of 'Trefoil logo', ie the visual three-leaf logo are strung. The concept has three leaves symbolize the meaning of the Olympic spirit that connects the three continents. Since then Adidas became the official shoe used in Olympic events worldwide. Finally, after years of triumphs and suffered the vagaries of business development, in 1996, Adidas undergoing modernization by implementing the concept of 'We Knew then - we know now' more or less describes past successes and glory to this day. The new logo is a visual form of three blocks that make up the sloping hill that illustrates the strength, durability and future. Since then the Adidas logo never change, and still prevail today.